I had been thinking about my next subject to cover and had some trouble deciding (there are so many!). The problem sorted itself out, though. 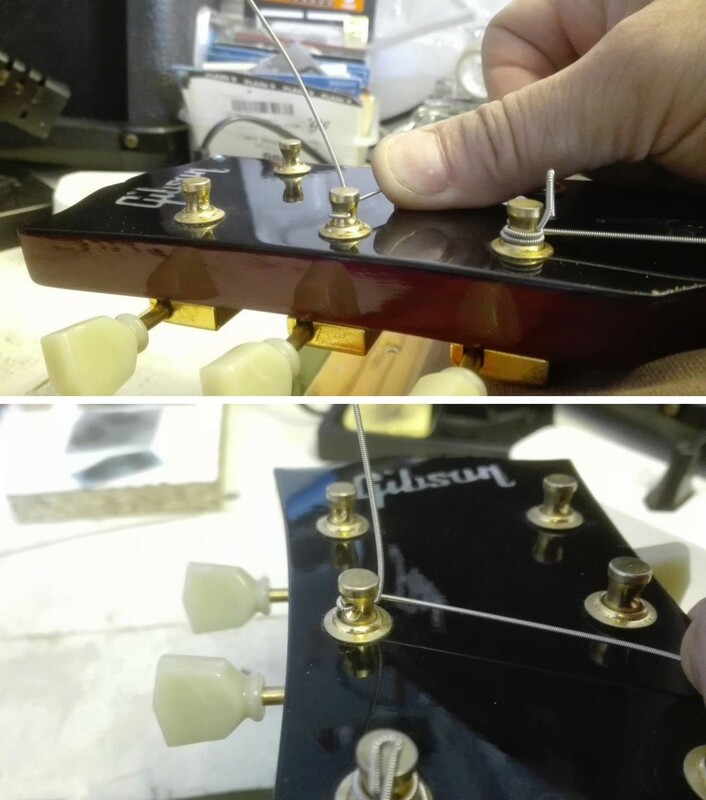 I don’t really believe in signs, but when one customer after the other starts asking me about the way I string guitars, maybe that means a word of explanation is due. 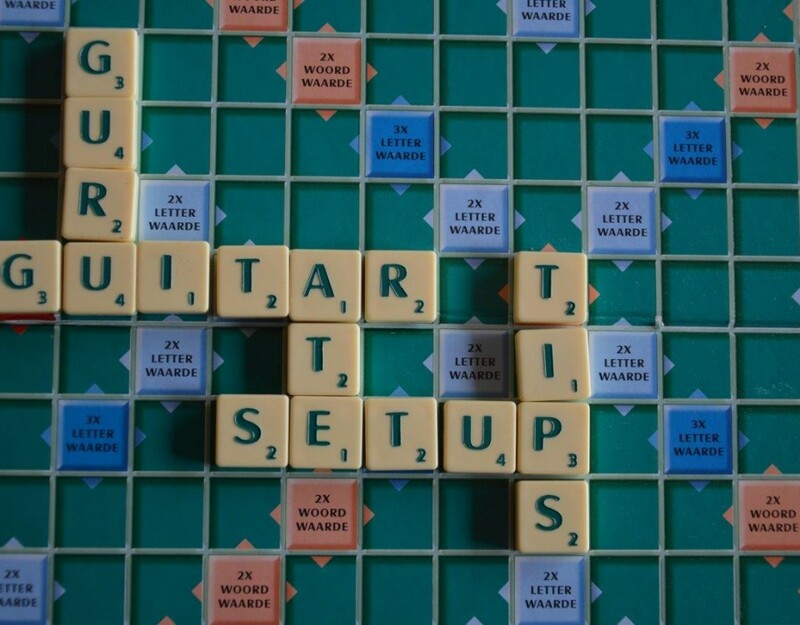 Does YOUR guitar drift out of tune too? There might be several possible causes, but why not start by looking into the most probable one? 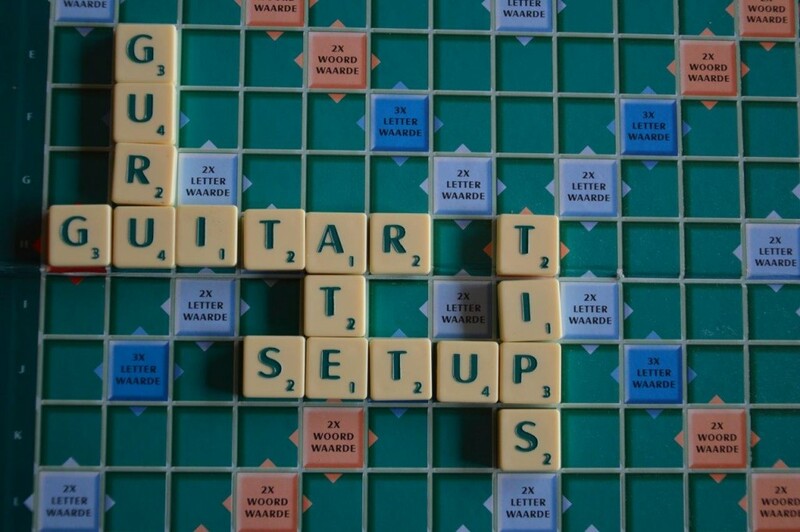 With a poorly strung guitar, even modest tremolo use or simple string bending may ruin your tuning. 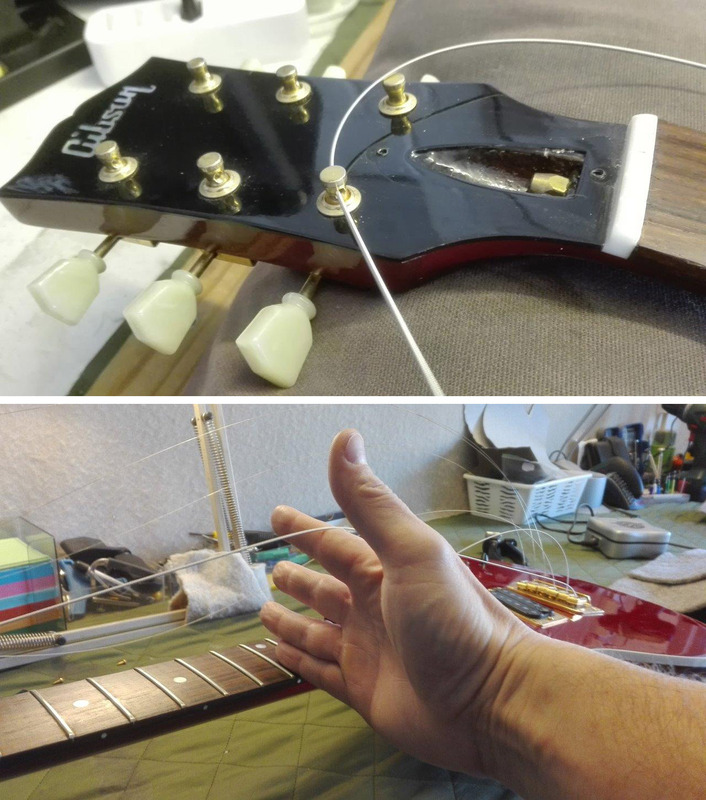 First, let me make one thing perfectly clear: there MUST be other ways to string guitars in a rock-solid way. 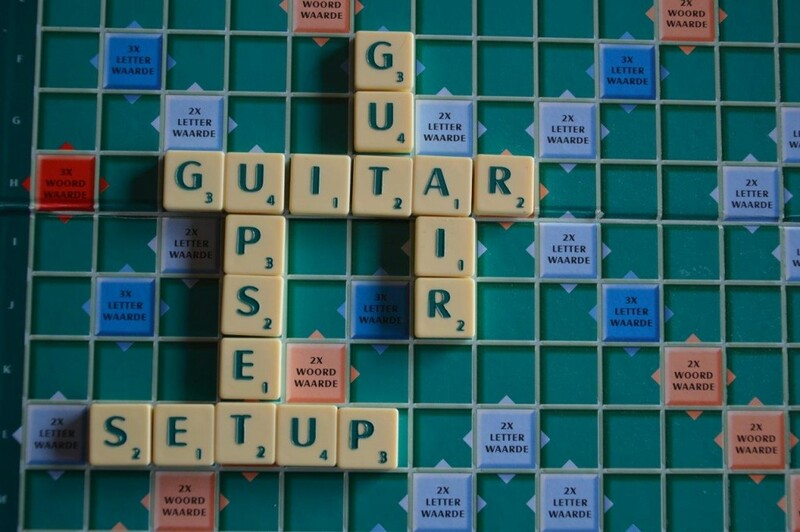 If you’re using a different method and your guitar stays in tune – by all means, don’t change it. If not, read on. 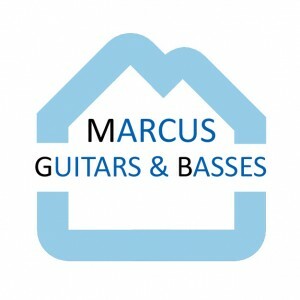 And honor to whom honor: the Marcus method of stringing isn’t actually mine at all. I’ve learned it more than 20 years ago from Jacky Walraet, my teacher at the School of Lutherie in Puurs (Belgium). So let’s get started, shall we? From here on, there won’t be too many words but LOTS and LOTS of pictures. 6-in-line or 3-per-side? The difference is minimal. I’ll use a Gibson Nighthawk guitar for this blog post. Let’s take a look at our first picture. We’ll start by inserting the low E (or B, if you have one of those), from the center outwards. Next, slightly spread the fingers of your right hand to create some slack. This simple twist alone already does a great job of preventing string slippage. There’s no better way to illustrate this than with the following picture. As you can see, I’m actually using the string to lift the guitar up from its neck rest!! Give it a try, you’ll love this! You’re almost done with your thickest string. All you need to do now is bend the string end so that it points upward (as shown in the right half of the above picture), guide the string with a bit of downward pressure from your index finger, and start turning the tuning peg – I like to use a string winder for this – until there’s just enough tension to rest the string in its appropriate nut slot and let go. 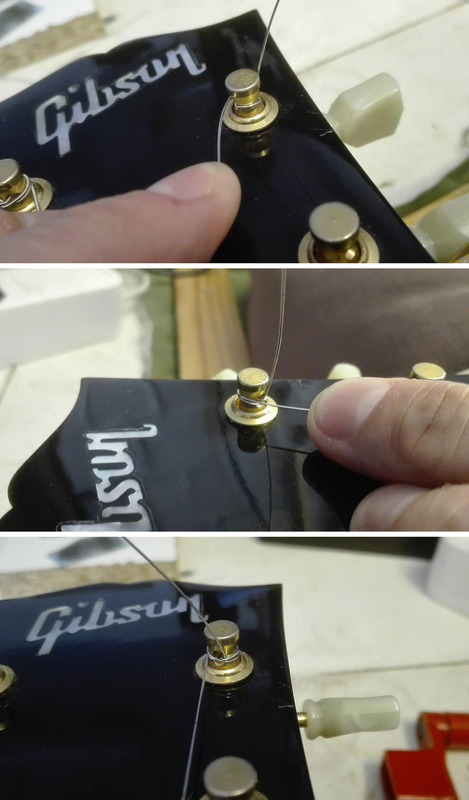 Then tune the string to pitch, and you’ll now have a nice, limited number of string post windings. Don’t get discouraged if your result isn’t perfect right away, or if it has taken you some time to nail it. There’s a learning curve here, especially in finding the right amount of slack. 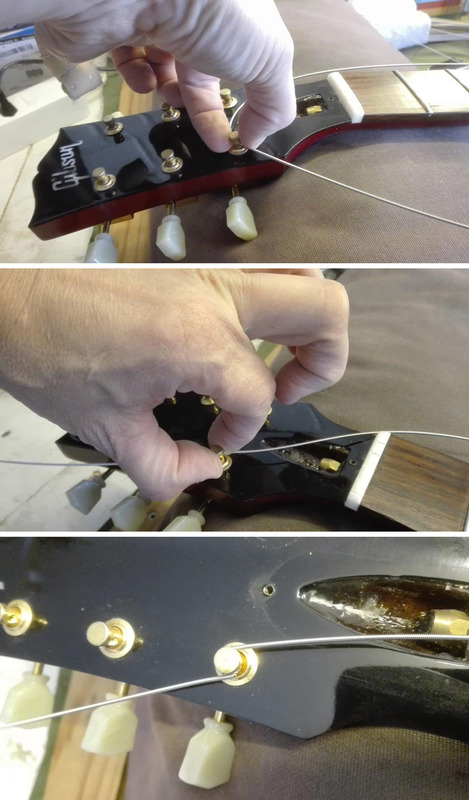 It IS important, though: if you don’t have enough turns, there might not be enough downward pressure on the nut, resulting in poor tone or even a buzzing open string. This risk is especially real when your guitar doesn’t have an angled headstock (i.e. Fender style instead of Gibson style). Too many windings are bad as well: if the string starts to wind on top of itself, better start over. An ugly tangle of string windings WILL ruin your tuning, especially if your playing style includes frequent string bends or tremolo use. 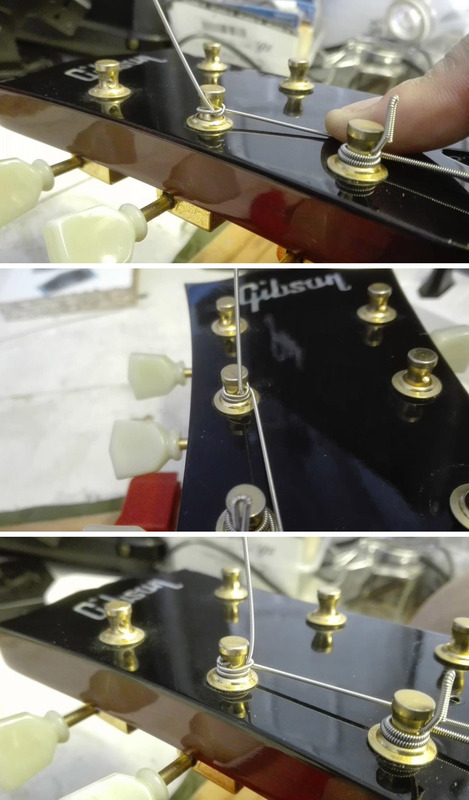 The procedure for the A-string is quite similar, but its lower thickness allows for something extra: a loop. The string will actually lock itself down, thus providing extra stability. The top picture is taken after applying the initial twist. Now take the loose end, wrap it around the post (clockwise), guide it underneath the string and pull it tight. 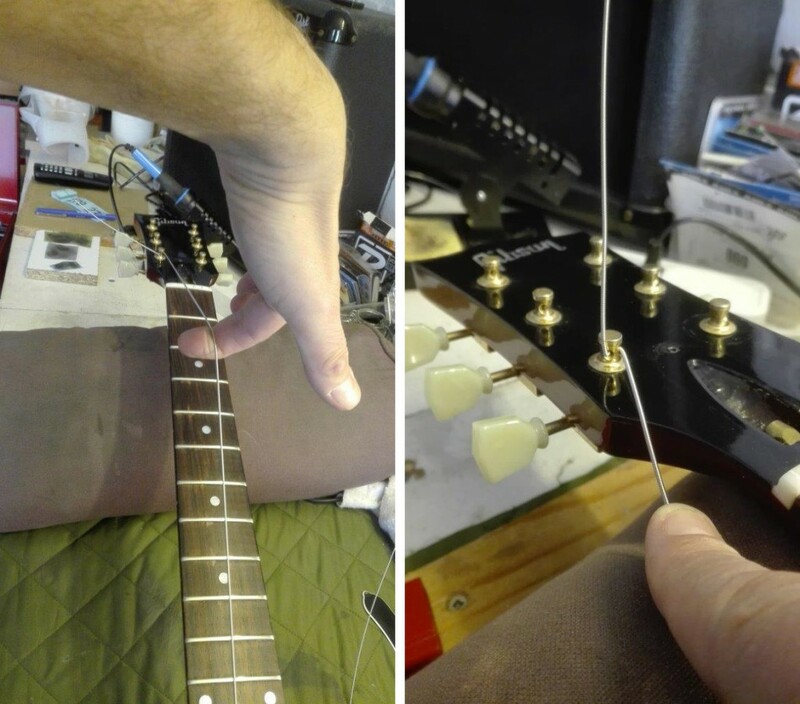 Like with the E-string, you may now cut the string to size and bend it double. Or not, that’s completely up to you. From that D-string on, one last additional manoeuvre is added. This time, we won’t be guiding the string downward just yet. 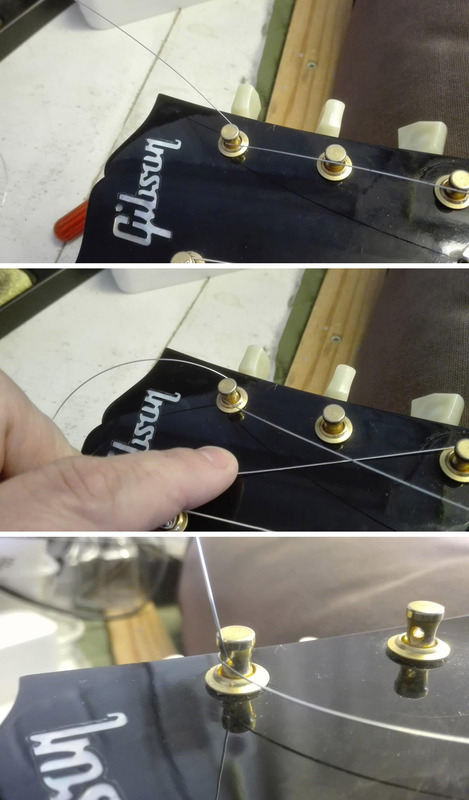 Remain above the string at first, and then – once again using your index finger as a guide – utilize the loop point to cross over to the lower part of the string post. You can see what this crossing should look like in the middle part of the picture. In the lower part, you can see the result from yet another angle. All that needs to be done now, is cutting and bending the string’s end. So why exactly am I passing first above and then below the string hole? Simple: string posts usually have a conic shape. 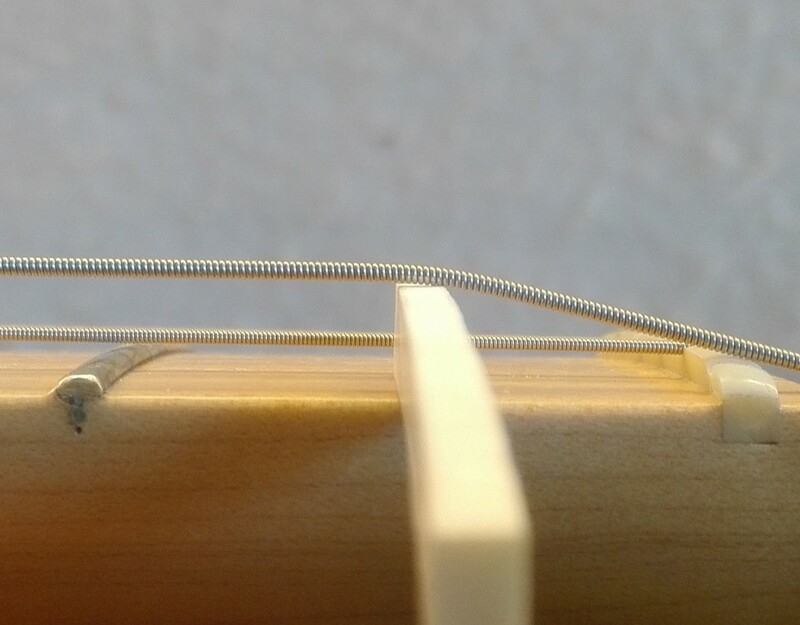 When you’re tuning the string, the increased tension will cause the upper and lower passes to shift towards each other, exerting pressure on the points where the string enters and leaves the string post holes. 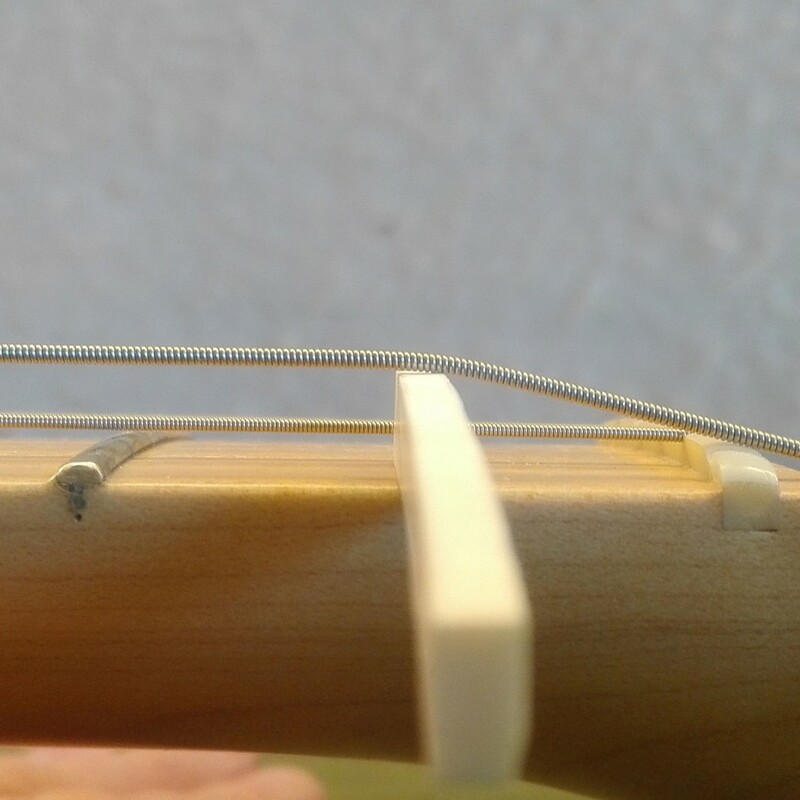 This again will help the string to hold its original position, reducing tuning problems as a result. 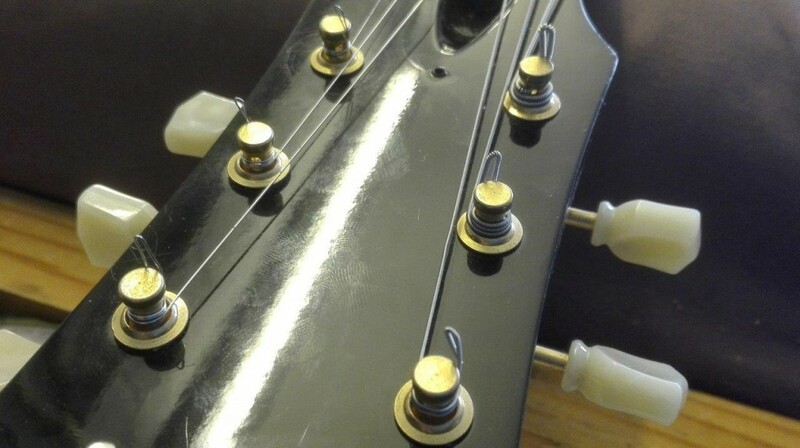 When your guitar has a 6-in-line style headstock, you may now proceed with the remaining strings in exactly the same fashion as you did with the D-string. Beware of one thing, though: if your guitar only has a single string guide (for the B and high E), you might get in trouble with the G-string. Why is that? 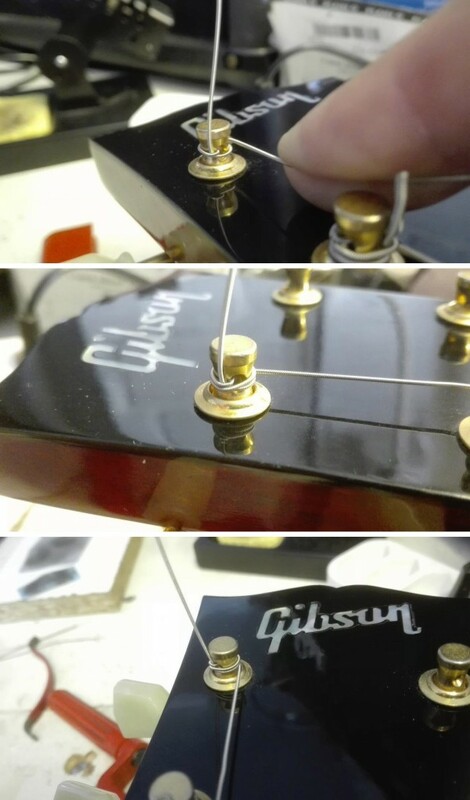 The G-string has to travel quite a distance from the string post to the nut. Without a string guide to press it down, the string might pass through the nut slot without hardly any angle. This is a tone killer, and a likely cause for open string buzzing. 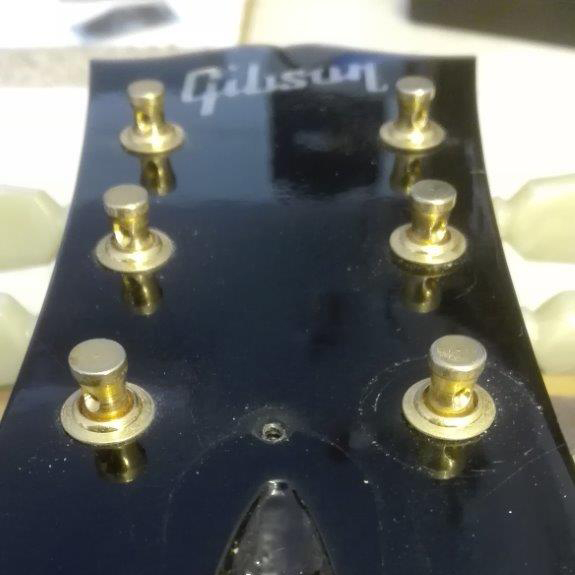 To reduce this problem, you could either install a second string guide for the D- and G-strings, OR you could provide the G with some more slack so that it gets a few extra windings around the string post. In other words: don’t cut this one quite as short as the other strings. This will give you a better angle. If you’re stringing a 3-per-side style headstock, the G-, B- and high E-strings follow the mirror image of the D-string’s pattern. For reasons of clarity, I will add some pictures of this procedure as well. No further explanation required. You know it by now. This should keep you busy for next month, right? Just don’t forget to actually PLAY that thing, too! P.S. : taking a reader’s comment to mind, I’d like to add something I believed to be obvious. Maybe it wasn’t that obvious after all. So here it is: after stringing your guitar, regardless of the method you used, it’ll take some pre-bending or stretching before the strings will actually attain stability. Keep that in mind, will you? If you like my articles, please share them on the timeline of your Facebook pages. Spread the word. Leave a comment (you can do that at the very bottom of this page). Start a discussion. Also, I thank you for using the product links. I receive a (very) small percentage when you buy something. Some sort of income, however modest, keeps a person going. So again, I thank you. You are wonderful people. Musicians make the world better. The REAL ‘One And Only’ Sensible Setup Sequence – finally! Any special tips for when you’re using locking tuners? Hi Erwin! That’s a very relevant question. With modest or no trem use, you COULD string the guitar exactly as I’ve described, but as doing so won’t add extra tuning stability, why bother? 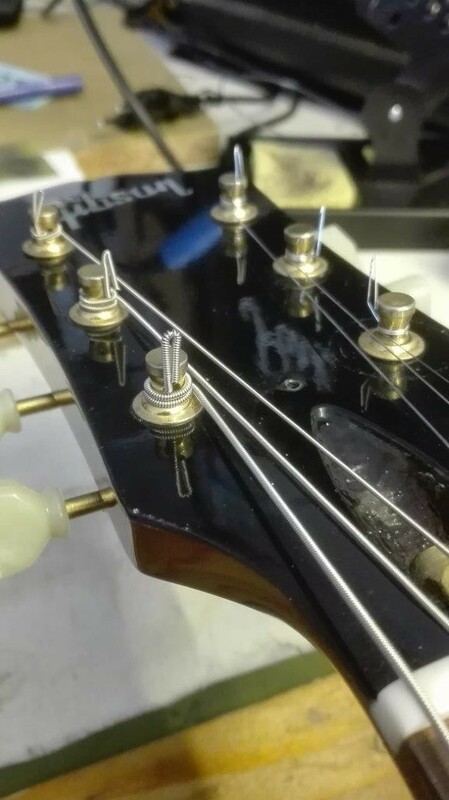 Well, there IS one situation that calls for extra (downward) windings, and that’s when YOUR combination of headstock angle, string post heights, presence or absence of string guide(s) and so on, results in insufficient downward string pressure on the nut (you can tell when your open strings start buzzing in their slots, or when the open strings have poor tone qualilty). In that case, you should definitely add those extra windings. Otherwise, go for no windings at all. And here’s how to do that. 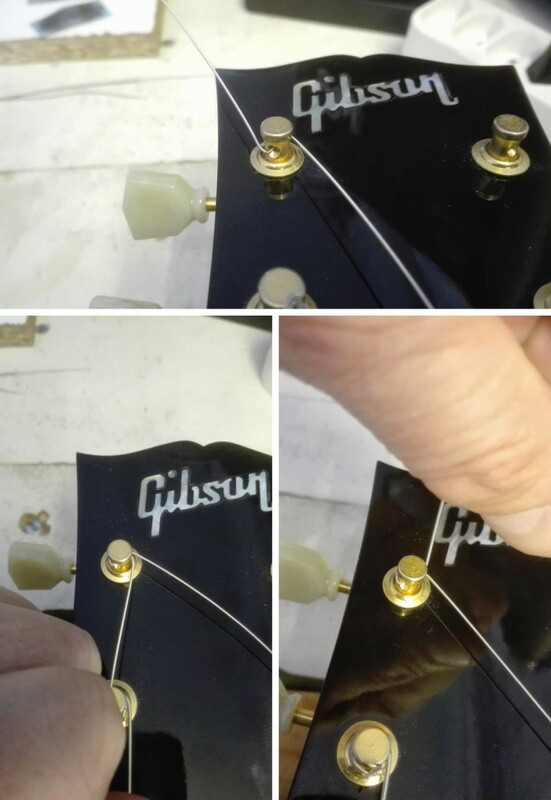 Instead of using the “arrow-head position”, start by turning all string posts so that the string holes point toward the nut. Insert your low E. Gently pull it snug, and tighten its locking mechanism. Tune to pitch. You probably won’t even need a full turn. If you DO need more than one turn, make sure to guide the string downward, to maintain sufficient downward pressure. Repeat for all strings, and you’re done. 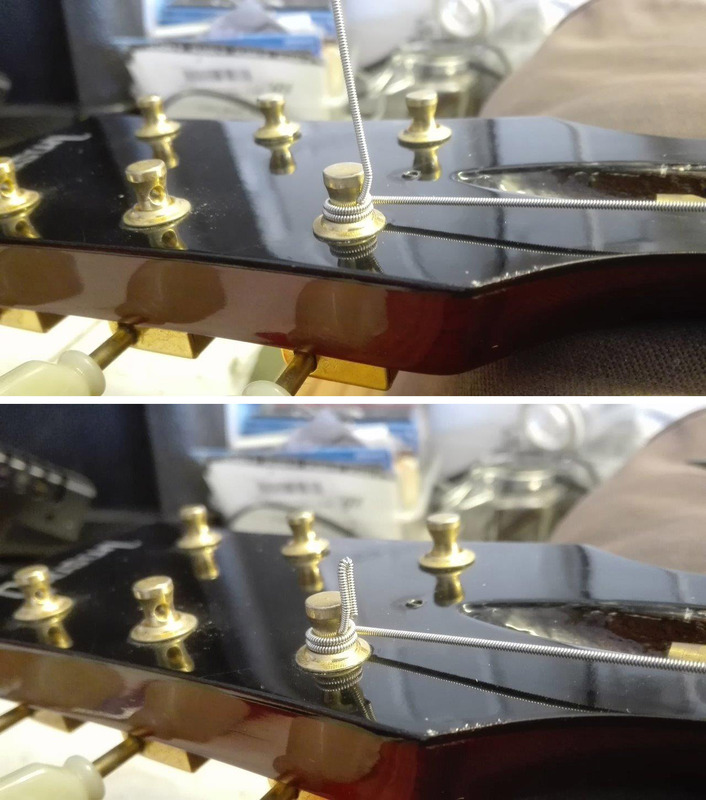 I almost forgot: if your tremolo floats instead of resting flat on the body, be sure to block it in stringed position before you remove your old strings. 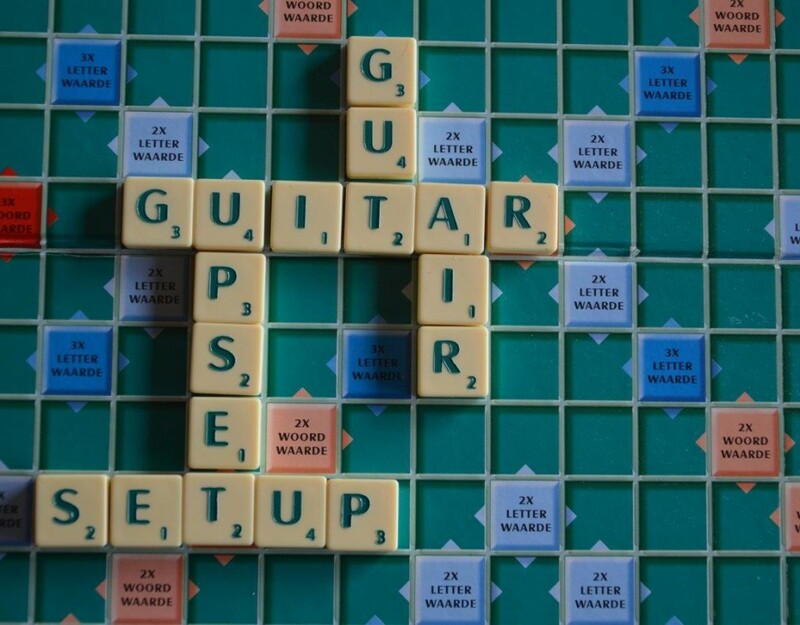 You can stuff a towel or a rag underneath it, or use a wedge made of a soft material that won’t harm your guitar top. If you don’t block the tremolo, it will lower dramatically when you take off the strings. 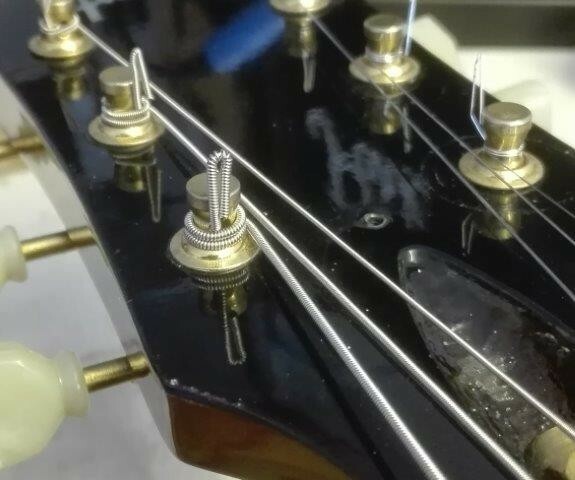 If you restring the guitar while the tremolo bridge is in that position, you’ll end up with several windings around the string post – which is exactly what we were trying to avoid. Erwin, I hope my answer was helpful. Thank you again for reading and commenting, and see you next month! 40 years? I guess that SURELY makes it a proven technique. Great idea to pass it on, Bob. And thank you for your comment. Hope you’ll return for next month’s post! Very precise manual! 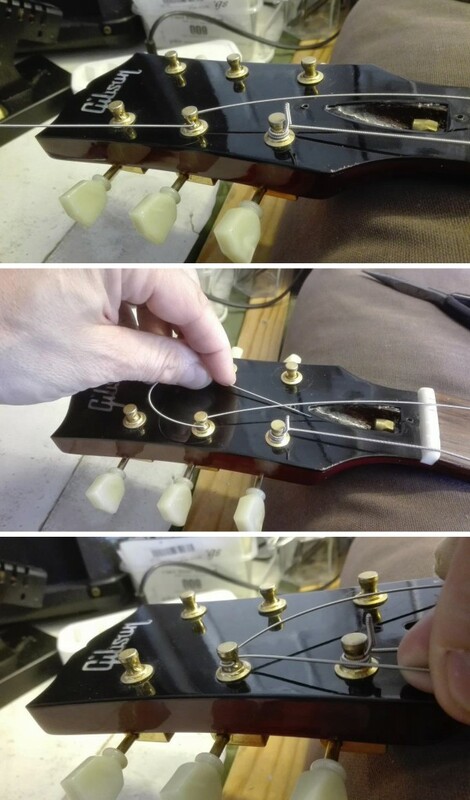 But pre bending each string would be the topping on the cake as a last step. Thanks for your kind words, Peter. You are absolutely right about pre-bending or stretching the strings. I had actually thought of adding that explicitely to my article, but decided that it was obvious. Common knowledge, so to speak. Maybe it isn’t. You know what? I’ll add it. By the way, remarks like these are valuable and helpful, and much appreciated. ALL readers can benefit from them.